Can the left’s grassroots activists curb Trump’s influence? Ten days before President Donald Trump took the oath of office, Hillary Shields and about 30 other progressive activists showed up to a small public meeting in Missouri to confront Sen. Roy Blunt. The group peppered staffers of Blunt (R-Mo. ), a member of the Senate Republican leadership, with questions about the future of the Affordable Care Act and other Obama-era policies the incoming administration seemed poised to undo. “We took pictures, live tweeted and just started trying to get the message out there that people are upset and Congress needed to listen,” Shields recalled in a recent interview. The pictures made their way to Rachel Maddow’s show on MSNBC. Shields, like many other Americans on the left, were shocked by Trump’s victory last November. After the election, the 32-year-old paralegal from Kansas City, Missouri, helped found the Kansas City chapter of Indivisible, a liberal grassroots political group dedicated to opposing Trump’s policies. Now, Shields is leading the chapter in a burst of local activism aimed at stymieing Trump and the Republican-controlled Congress. READ MORE: What have we learned from President Trump’s first 100 days? In the first 100 days of Trump’s presidency, a legion of new progressive groups like Indivisible, Swing Left and Daily Action have sprung up around the country. Trump came into office promising to enact a bold conservative agenda. As he reached the informal marker of his early presidency, he pointed to wins like the confirmation of Supreme Court Justice Neil Gorsuch and executive orders that undo a lot of ‘damage’ from the previous administration. But so far many of the 10 legislative goals Trump outlined as a candidate for his first 100 days in office — a wide-ranging list that included repealing and replacing the Affordable Care Act and securing money to build a physical wall on the Southern border — have been blocked or stalled in Congress and the courts. “We’ve seen the least productive presidency in modern history,” Ezra Levin, Indivisible’s executive director, said in a phone interview. That’s hard to prove, but whether or not it’s true, it’s clear that the left feels energized under Trump. And now, as Trump is moving forward from this informal early mark of his presidency, activists are working to ensure their efforts to resist his agenda are sustainable. As Trump is moving forward from this informal early mark of his presidency, activists are working to ensure their efforts to resist his agenda are sustainable. In less than six months, Levin says his group has grown to more than 6,000 local chapters in every congressional district. Everyday citizens, like Shields in Kansas City, are mobilizing tens of thousands of activists to show up at town halls, marches, and make coordinated calls to their representatives. In a new report to be released this week, the liberal Center for American Progress Action Fund cited Indivisible as an example of the left’s success in forming communities and taking meaningful actions to resist the Trump administration. READ MORE: Is socialism in the United States having a moment? Democrats, struggling with their identity in the aftermath of November’s loss, are trying to better position the party for 2018. The Democratic National Committee, hoping to attract a younger, broader base of voters, elected former Labor Secretary Tom Perez and Rep. Keith Ellison (D-Minn.) to lead the group; Perez and Sen. Bernie Sanders traveled the country during Congress’ spring break on a ‘unity tour’ to rally support for the party. But Tisch Sussman said that focusing on “local parties and the grassroots are more important” to actually rebuilding the party. For example, when House Republicans were on the verge of voting to repeal and replace the Affordable Care Act in March, Tisch Sussman said her team was in communication with various grassroots groups, sending them the latest whip count and sharing data on how the new bill would affect people in different congressional districts. “Public pressure is one of the most effective tactics [to oppose] this administration,” Tisch Sussman said. 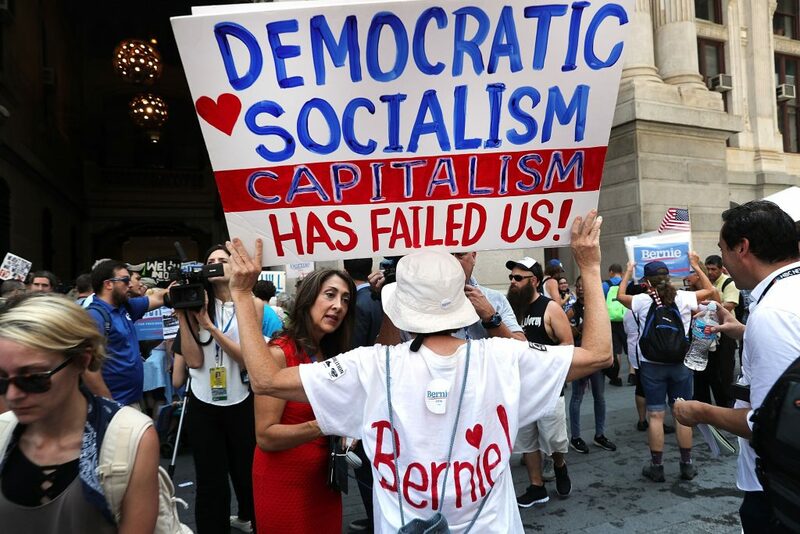 Bernie Sanders supporters protest in Philadelphia. “Public pressure is one of the most effective tactics [to oppose] this administration,” Tisch Sussman says. Photo by Spencer Platt/Getty Images. Members of another group, Daily Action, flooded U.S. Customs and Border Protection with 21,000 calls in February opposing Trump’s initial executive order on immigration, which included a temporary travel ban on visitors from seven predominantly Muslim countries. John Burton, Daily Action’s political director, said that approximately 270,000 people have signed up for the group’s daily text alert, which sends out a reminder to place a call to members of Congress protesting legislation, executive orders and other moves by Republicans in Washington. Burton said 160,000 people have made at least one call. Forty thousand calls — the most for any single issue — were made to oppose White House chief strategist Steve Bannon’s inclusion on the National Security Council. Trump later removed Bannon from the NSC. But the White House did not cite the calls opposing Bannon’s seat on the NSC as a reason for his removal, making it hard to gauge how much impact — if any — liberal groups had on the final decision. “Public pressure is one of the most effective tactics [to oppose] this administration.” – Emily Tisch Sussman, campaign director for the Center for American Progress Action Fund. But while Trump has suffered some early setbacks, the administration is still forging ahead on a number of policy fronts, a sign that the left’s early claims of success might be premature. The president has signed numerous executive orders rolling back regulations put in place by his predecessor, former President Barack Obama. While the travel ban portion of his immigration order is stalled in courts, other parts of Trump’s immigration agenda are moving forward. In April, the Senate confirmed Neil Gorsuch, Trump’s Supreme Court nominee, handing conservatives a major victory. And Republicans still control both chambers of Congress, with a large majority in the House and a favorable map in the Senate in the 2018 midterm elections. Levin and other activists on the left hope to avoid burnout in the coming months and years. “We went 150 percent for the past four months and it’s been an odd combination of exhilarating and exhausting,” said Shields, the organizer in Kansas City. Still, Shields said she doesn’t plan on letting up. “I’m upset about a lot of policy,” Shields said. “But I’m really glad that the massive pushback is” happening. Correction: This story has been updated to indicate Shields met with one of Blount’s staffers, not the senator himself, and that she is one of several founding members of the Kansas City chapter of Indivisible. 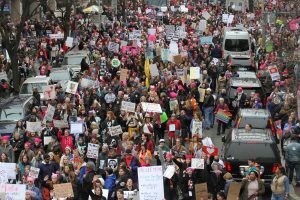 Left: Several hundred thousand people showed up for the Women's March on Washington in Washington, D.C. on Saturday, January 21, 2017. Photo by Abbey Oldham.